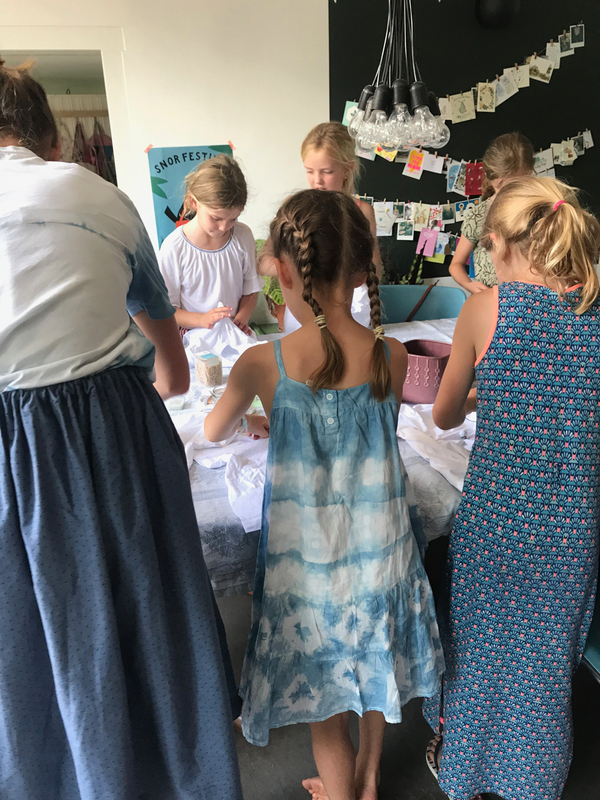 A shibori party for Ava’s 8th birthday party, so magical! 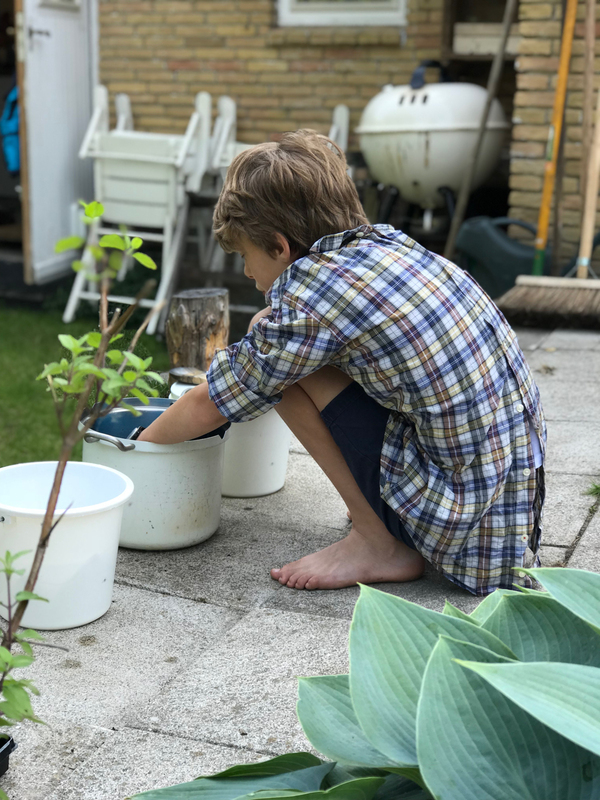 Did you ever try tie-dye when you were a child? I remember doing it at primary school and loving it! 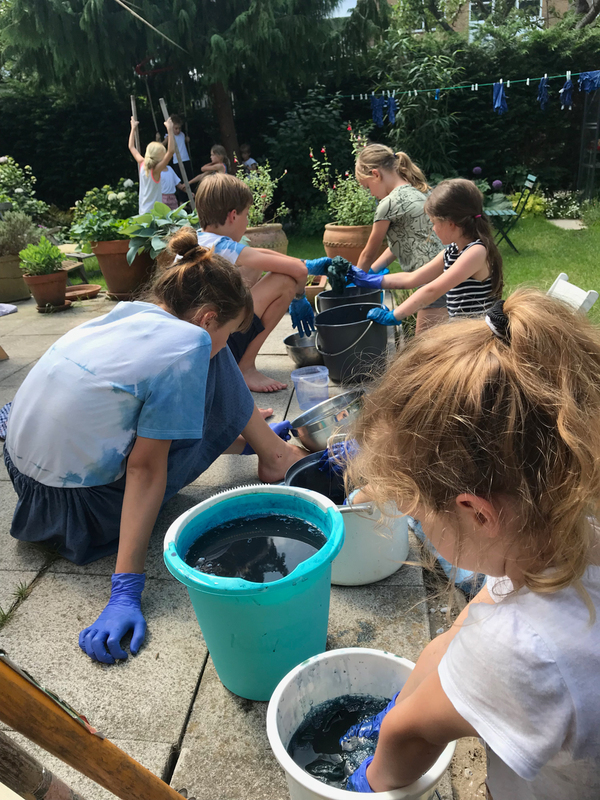 So for Ava’s 8th birthday party, I thought it would be fun to make Shibori style tie-dye t-shirts with the girls. 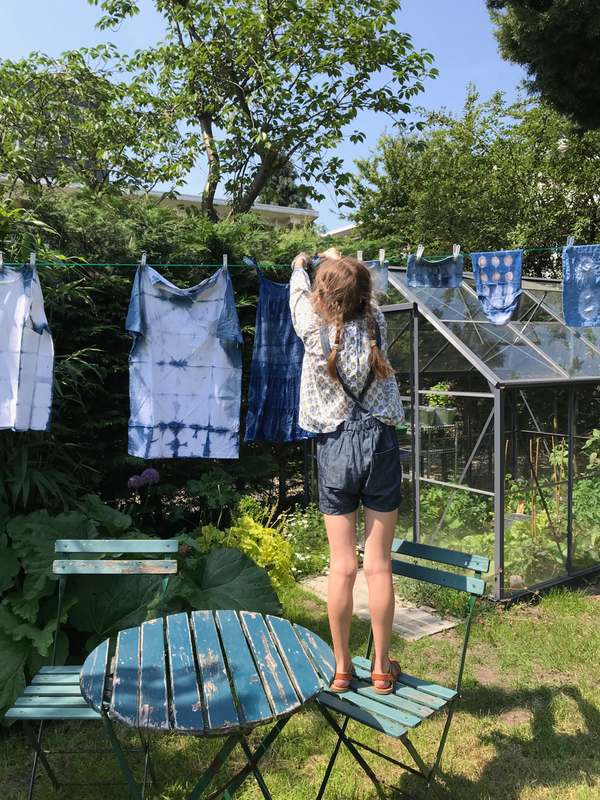 I had done tie-dye before with my children years ago (look at Casper in this post! ), but used store bought acrylic fabric dye for that project. 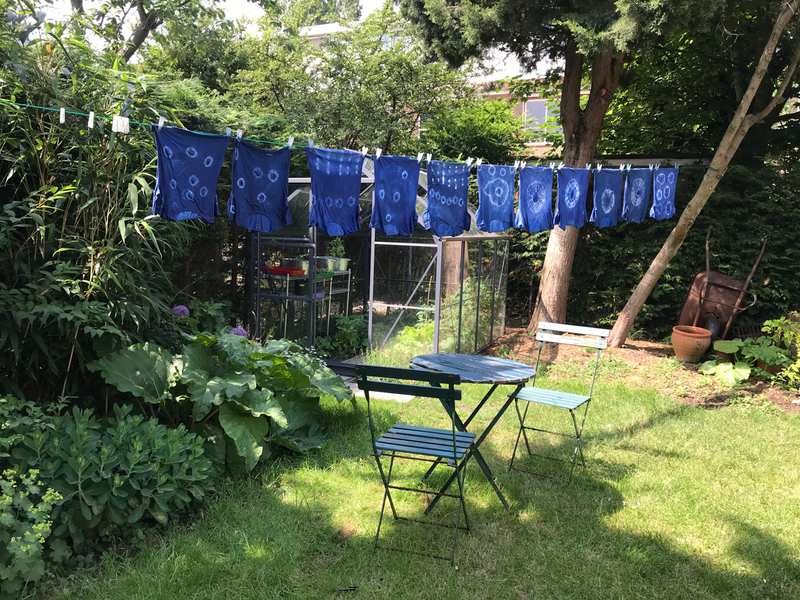 I wanted to try real, natural indigo this time! 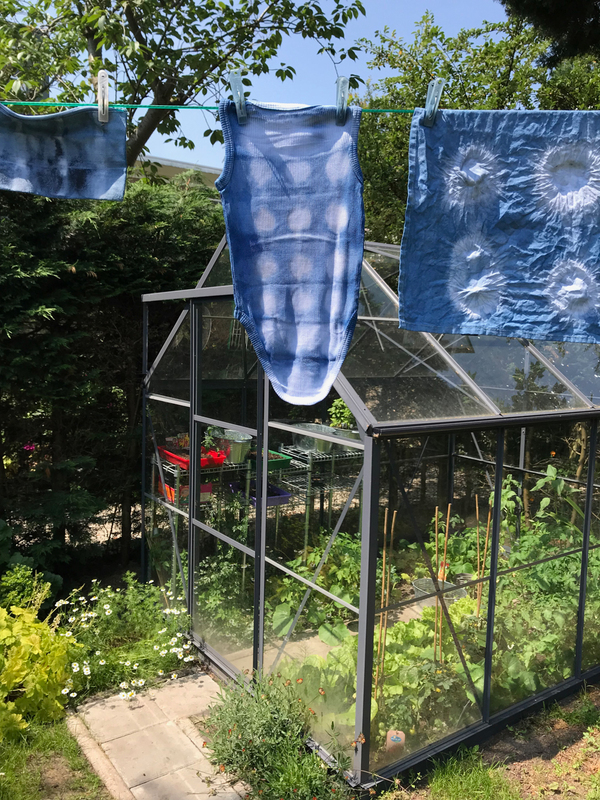 I’ve always loved the idea of natural indigo and was eager to try Shibori — I love those deep shades of blue and pretty geometrical patterns. A week in advance of the party I ordered a few natural dye kits. (I ordered mine in the Netherlands, here. But just search for ‘shibori natural dye kit’ and you will find something in your part of the world.) 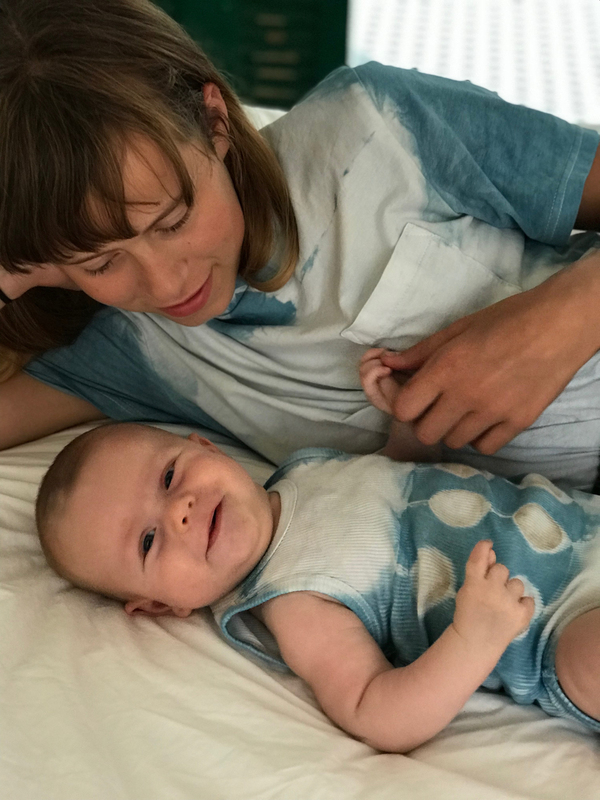 I also bought a stack of plain white, 100% cotton t-shirts in size 8 (plus two in Pim and Sara’s sizes), a white cotton onesie for Bram and a simple white cotton sun dress for Ava. All of which I pre-washed! The weekend before the party we tried the process. 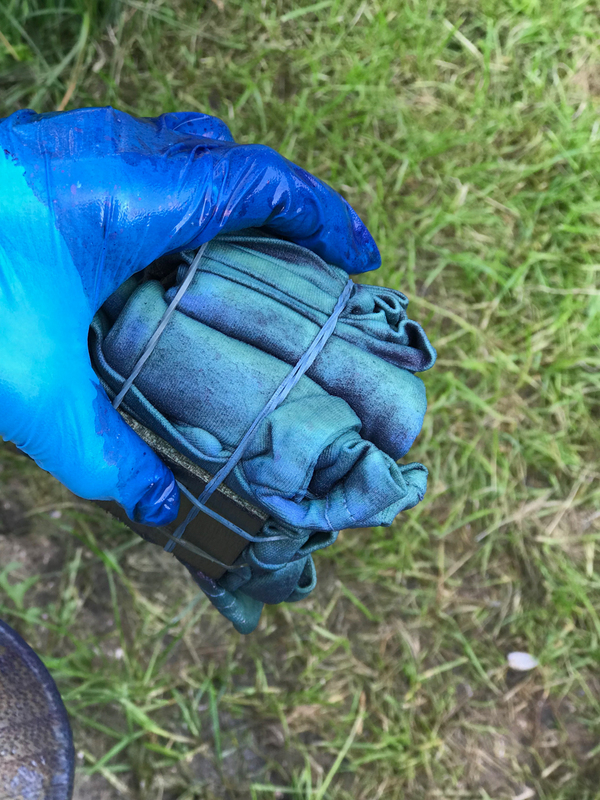 I mixed the dye on Friday evening, feeling a bit insecure about it. You have to be so careful not to stir too much, as you’re not supposed to get too much oxygen in the mix. And all of the ingredients are so strange! (All of this is clearly explained in the instructions which come with the kit.) But really, mixing the ingredients was easy and the next morning it looked ok enough, or so I thought, with a bit of foam and an oily layer. Like witch soup! We sat around the table and set to work. We used tons of elastic bands, marbles and cloth pins. Tamar also had sawn some small wooden squares to try out the folding techniques. 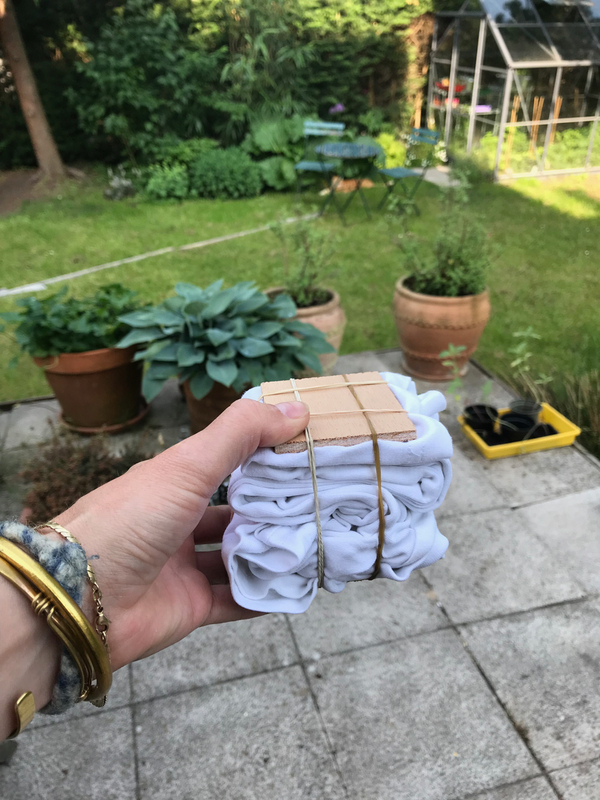 Sara and Pim made t-shirts, folding and binding with elastic bands. I made Bram’s onesie folding and binding with yarn. (I used little wooden discs I found in our craft kit and they would end up leaving a really cool brown residue!) 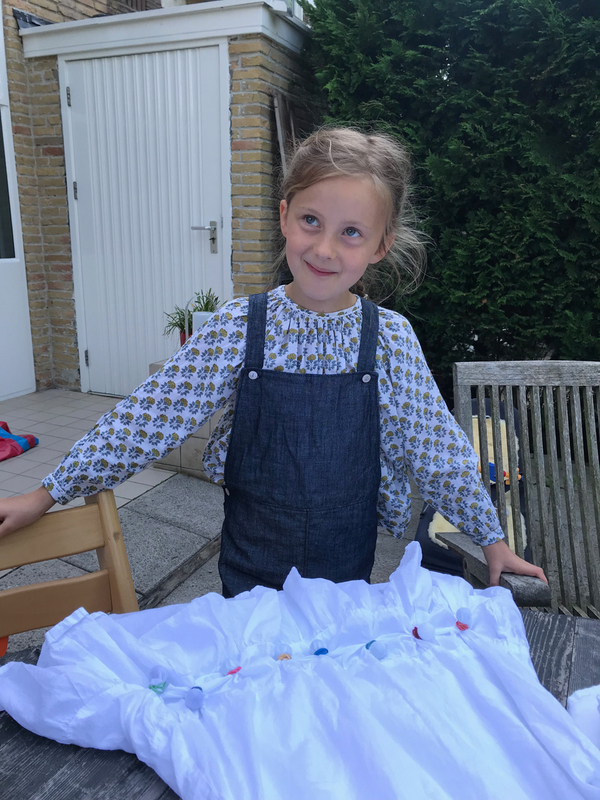 Ava worked on her dress, combining techniques and using marbles, elastic bands and folding it with cloth pins. I looked at this tutorial for folding and binding techniques, but there are tons of examples on the internet. And then it was time to dip our work! Dipping the pieces goes as follows: first dip the garment in water and wring it out. 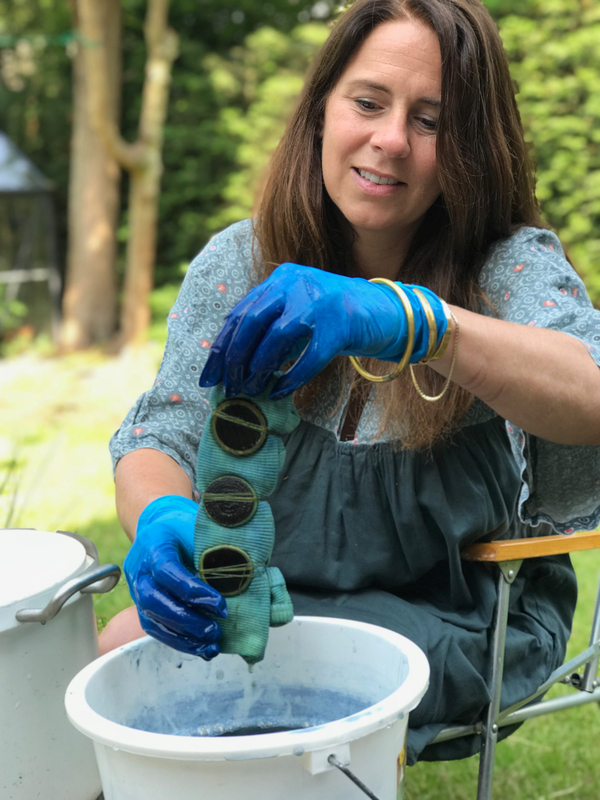 Then dip in the indigo vat, holding it quite still underneath the surface (just slowly move your fingers around it so that the dye will reach the entire surface of the bound piece). 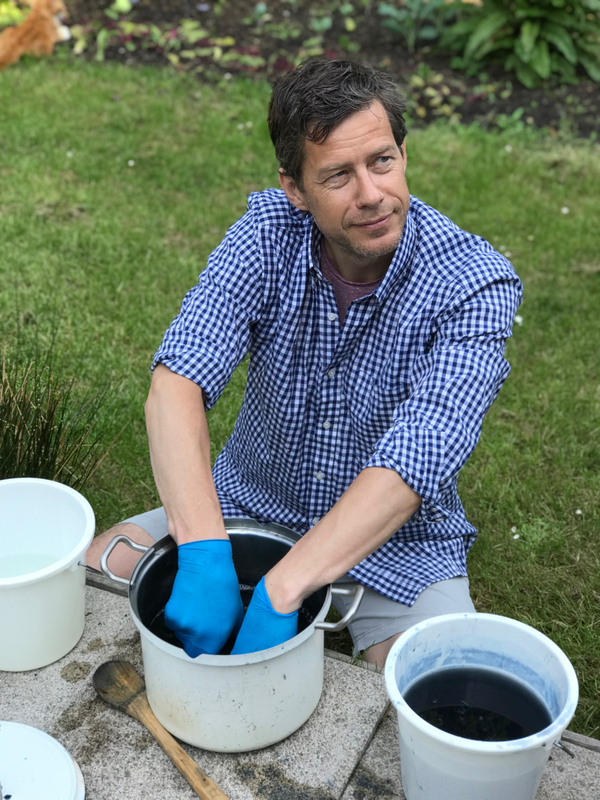 Try not to disturb the dye too much — we’re trying not to get loads of oxygen in the vat! 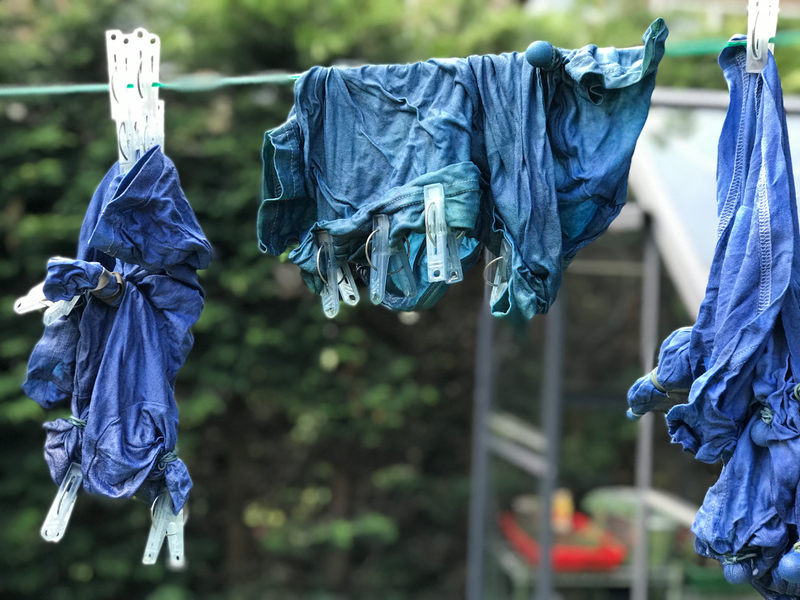 After 5 or so minutes, carefully squeeze the garment underneath the surface of the dye and lift it out gently. Squeeze out more. When you remove your fabric from the vat, it will have the weirdest colour — a strange yellowish green! Lay the piece on the grass. Do not untie yet! 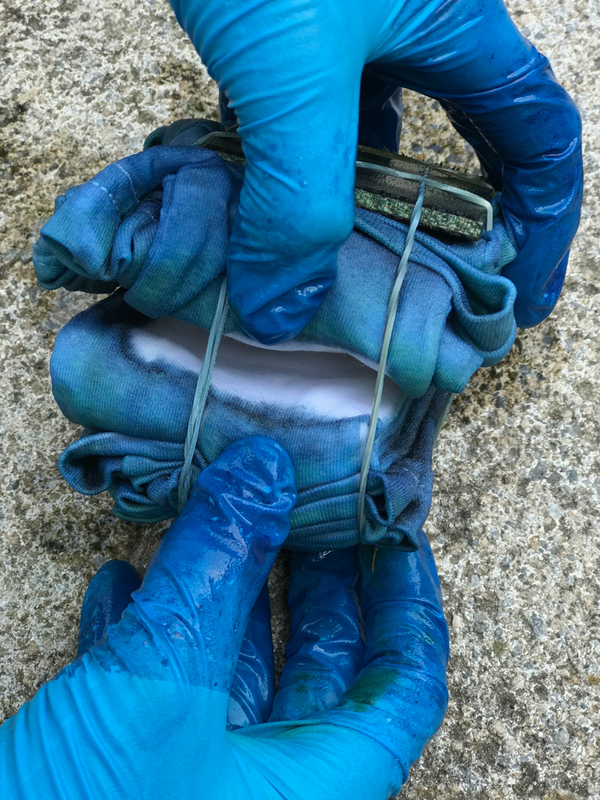 As the dye is exposed to oxygen it will turn dark blue. This really is such a cool and crazy process! Leave on the grass for around 20 minutes (or longer), then dip again. Repeat the process, again waiting 20 min to let the piece oxidise. You can even dip a third or fourth time but generally children can’t wait so long. Now rinse the (still bound) piece in clean, cold water. And then, the highlight: unfolding your work! Magic!!! They turned out so well! After unfolding and admiring the work, and rinsing again, I washed the pieces in the machine. Because the trial ended up successful, I felt confident enough I could pull this off with 10+ girls. 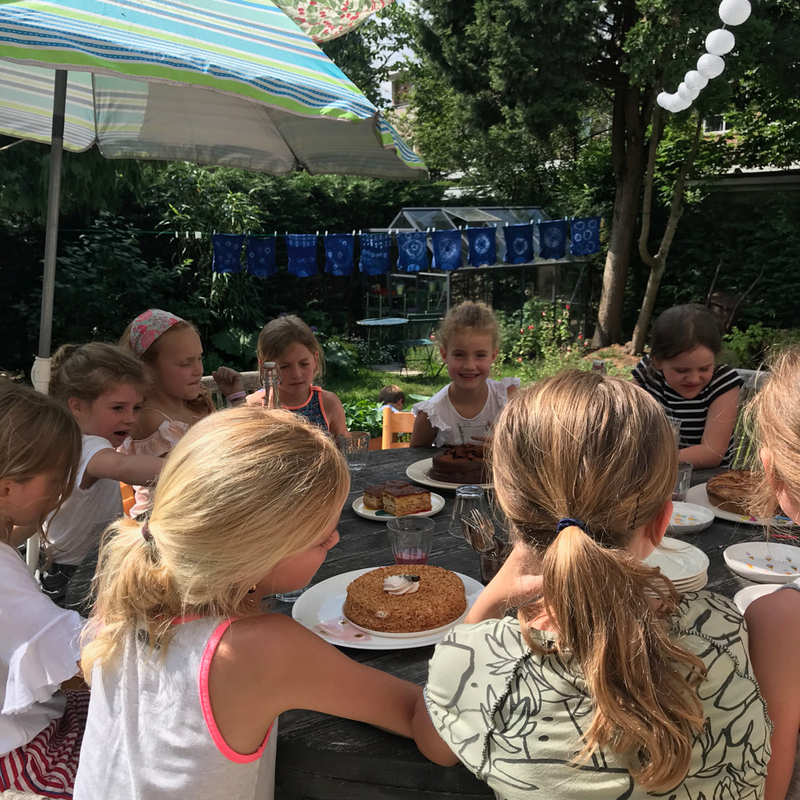 The day of the party, after lunch and when Ava had opened her presents, we sat the girls around the table and showed them the few examples of our Shibori trial session, explaining the process. 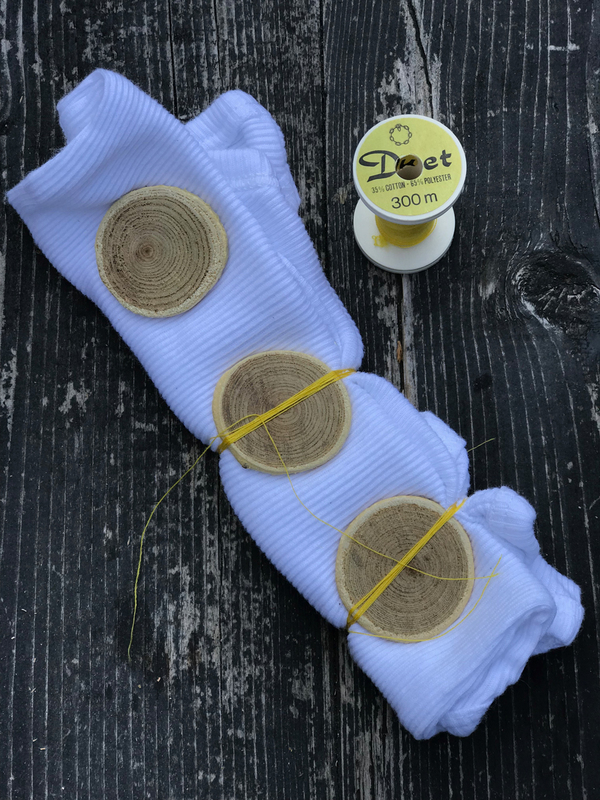 I each gave them a t-shirt and they then set to work, tying their shirt with elastic bands. Some used marbles as well, only one girl used the folding technique with cloth pins! I discovered I had to walk around a bit to make sure they tied the elastics tight enough, but besides that they all did a great job. We then let them each dip their garment in the vat. We had set ups three vats so the process wouldn’t take forever, Sara and Pim were each manning a vat, and me. In the meantime, Tamar oversaw the pencil case painting process (see tips below) and served lemonade etc. It all worked — the girls were really patient and they all wanted to dip a second time! 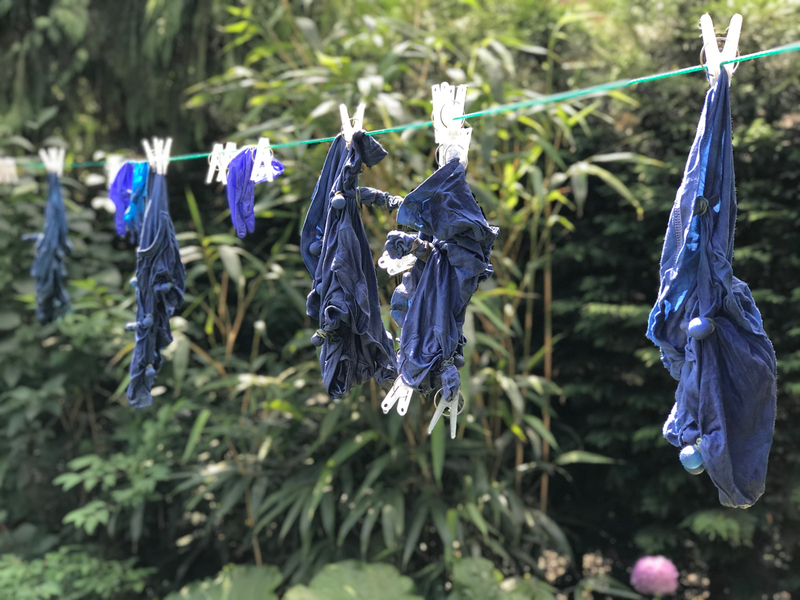 After letting the paint oxidise for another 20 minutes (after the second dip), we rinsed and unfolded the shirts. And they were SO cool! This really was such a fun and special moment! So exciting and magical, and the girls were SO proud! 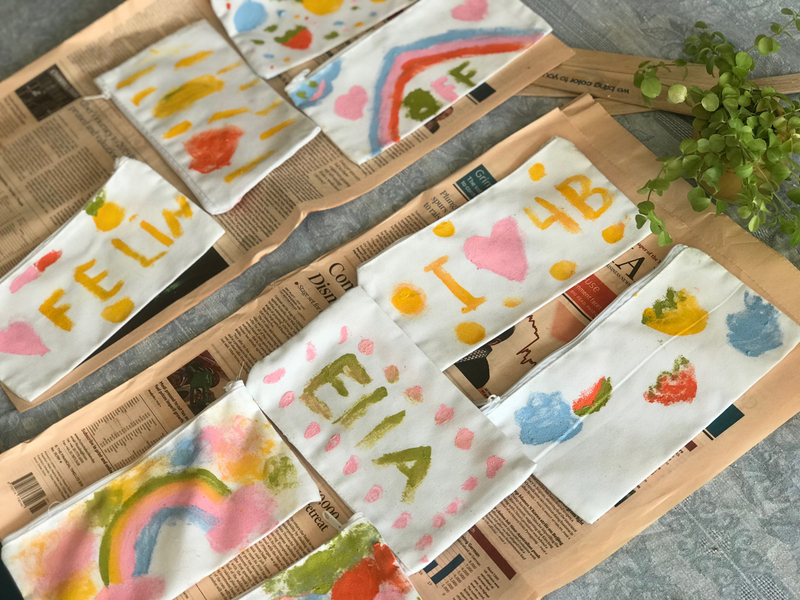 While the shirts were hanging to dry, we ate cake and sang for Ava, and when the party was finished they each went home with their own, handmade Shibori T-shirt. The next day at school, most girls were wearing their shirt. So super fun! 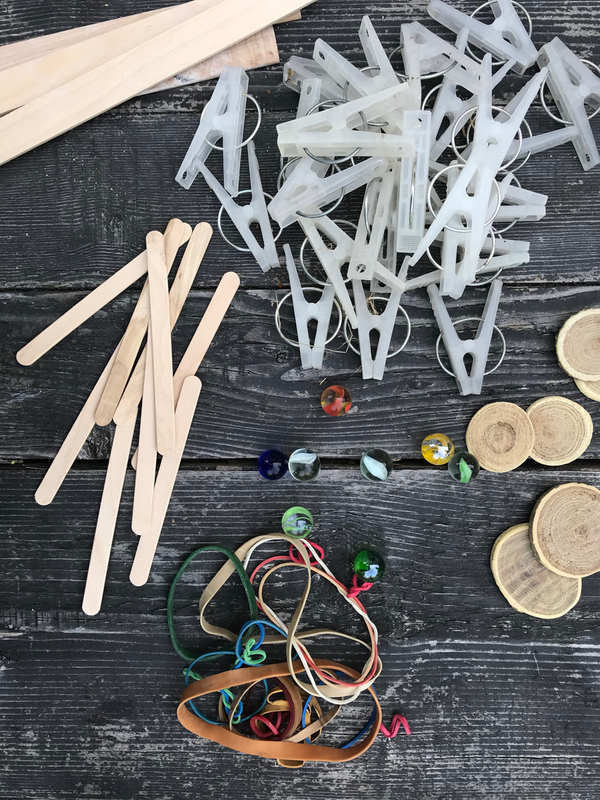 Buy enough elastic bands as they will be used most, and have tons of marbles ready too. Buy a box of disposable latex gloves. 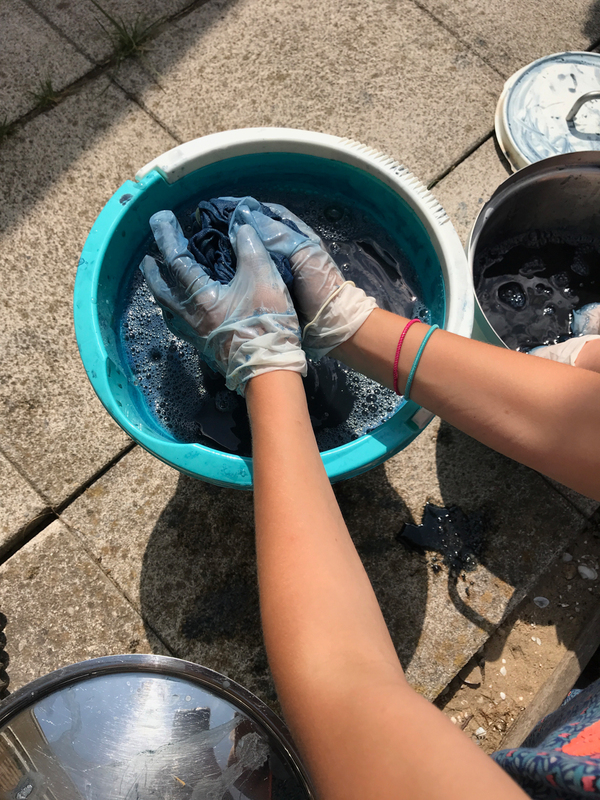 It’s impossible to re-use gloves during the dipping process! I had set up three vats so the entire process didn’t take forever. Sara and Pim and I each helped with a vat (making sure the girls didn’t stir the dye too much, and keeping track of the time, etc). Depending on the amount of children, I would have 1 assistant per vat, and one extra to take care of the rest of the group while they’re waiting. 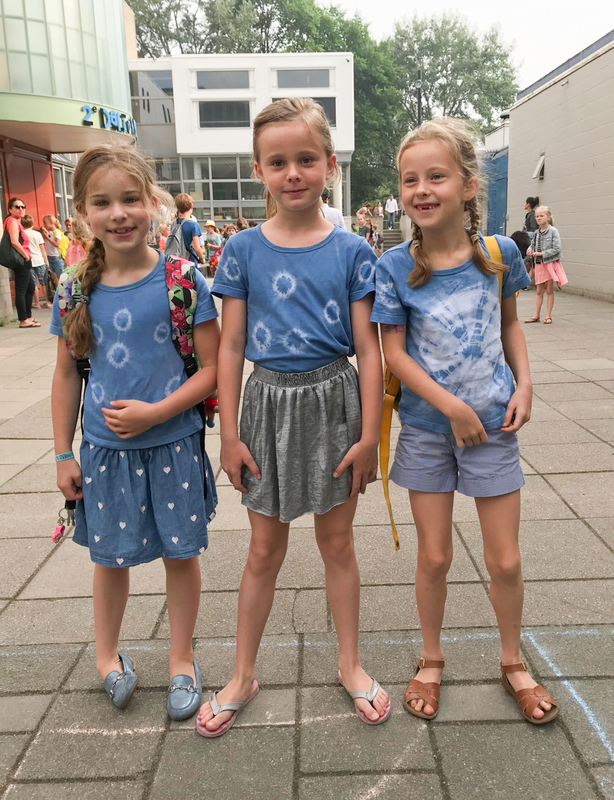 I had done tons of research on complex binding techniques and folds, but the girls all went for the traditional elastic band tie — creating a big or smaller ‘star’. Only some of them used the marbles or the cloth pins. None tried the more complex folding techniques! 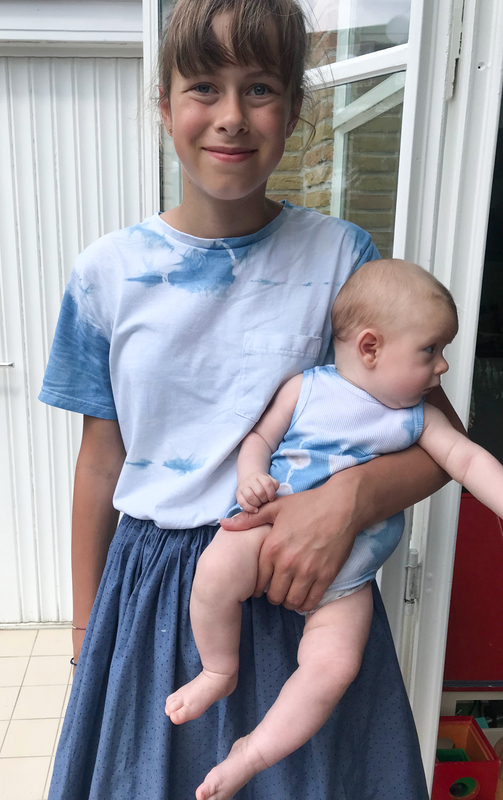 So if you ever try Shibori with children, just go for the more straightforward, simple styles. Because I figured I needed an activity to keep the girls occupied while they were waiting for their turn to dip, I had ordered plain white pencil cases, one for each child. I still had fabric paint, left over from this project. It was a good idea because the girls really liked painting these while waiting! And here some photos of Bram wearing his onesie and Sara her shirt. 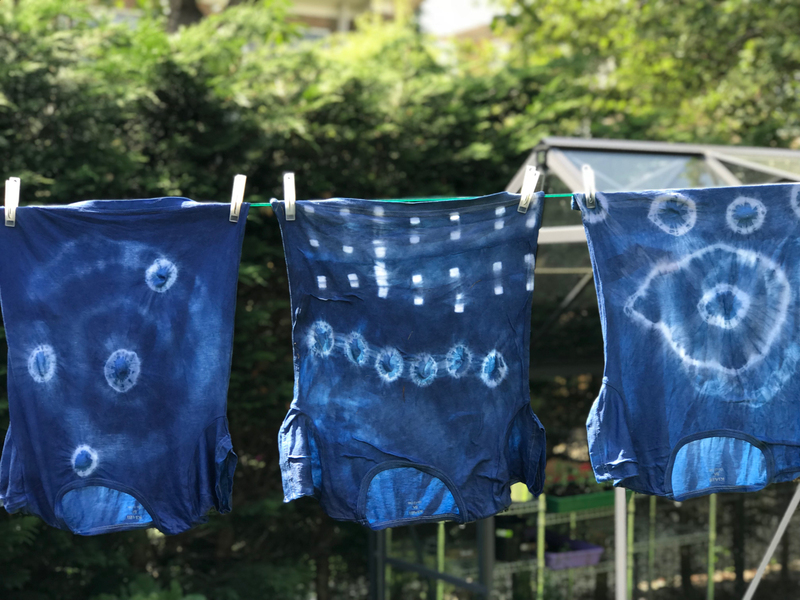 I’m going to definitely going to try Shibori again, I’ve already ordered another kit! Wow! This is utterly cool! I need to try this! Amazing! Wow!!!!! This is so amazing. Please can we get invited to all future parties?! 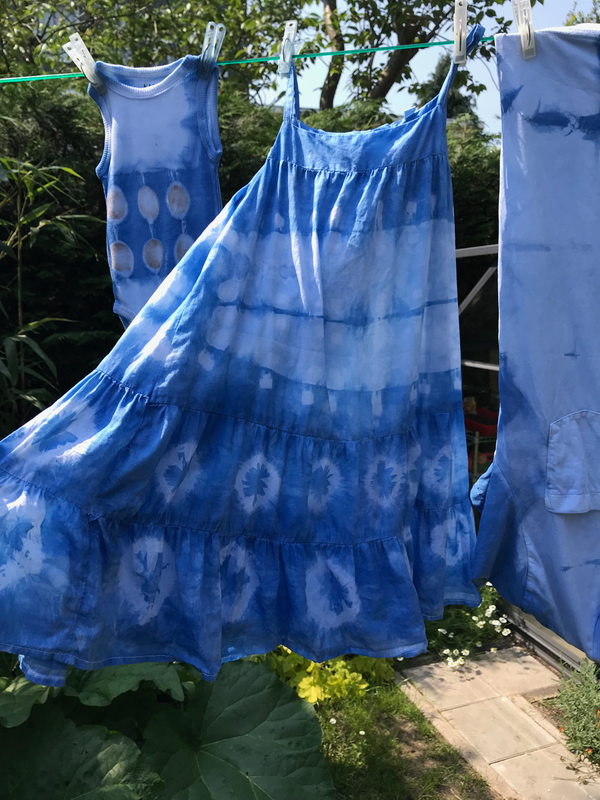 I do tie dyeing with my children every summer and it does not turn out as well as your beautiful creations !!!!! Well done. How many packages of the color did you buy for the party (is the it Indigo 1-2-3 color of the Dutch website)? Wow! Your backyard area is AMAZING! Can I live there? Thank you for sharing the birthday. I want to try all of it for my 9 year old this fall. I think she and her friends will LOVE it. This is so cool Esther!!! I was waiting for this tutorial since I saw it on your stories. I ordered the kit and can’t wait to do it with the whole family, and with my sister’s family who’s visiting from Paris…just as soon as this heat wave we’re having passes!!! !